The BlackBerry Curve 8900, one of RIM's newest and slickest smartphones, became available from T-Mobile just a few weeks ago. But even in the days leading up to its release, there already was Net buzz about the 8900's successor, the 9300, which is supposed to have an even bigger screen and other improvements — and is not due out until the end of this year. It seems like cell phones have a market lifespan as long as the average American's attention span, especially for cell phoneaholics who dream in CDMA and GSM. "The life cycle is definitely longer than the rumor cycle," said David Chamberlain, principal wireless analyst for In-Stat Research. "Lots of (the Net buzz) is wishful thinking." Chamberlain says most phones have a market life cycle of nine to 12 months. Go into a phone store and look for a model, say, X-7543-a, and if you don't get it that day, chances are the next time you look, the phone is gone, but there's a similar one called the X-7553-c. It still looks like the original — kind of — but it has a few new features. Or, try finding a battery for your mobile a year after you buy it and odds are you'll be hunting for one on the Web, and that your wireless carrier has long since moved on to newer models and doesn't carry a replacement battery in stock. Kevin Burden, ABI Research's mobile devices director, says a particular model can be available for between 18 and 24 months. But because phones "take a beating," and also are "visible extensions of our personalities" for most users, it's an item that "easily justifiable to replace every couple of years." In the United States, wireless carriers' policies of heavily subsidizing phones when customers sign up for one- or two-year contracts, reinforces the idea of change, even if you're perfectly happy with the phone you have been using. "Operators do this where they can because they know if the subscriber has a better phone, he or she is more likely to use services, which more than pay for the difference in cost on the phone," said Allen Nogee, In-Stat's wireless infrastructure and technology analyst. Tina Teng, iSuppli Corp.'s senior analyst, wireless communications, notes that "North America has a shorter replacement cycle" of less than two years for cell phones when compared to other countries where "the replacement cycle can go up to four to five years," something that is "definitely difficult to imagine for us." "In developing countries, with voice-centric phones and low incomes, people keep phones a long time," said Nogee. "Up until recently in Japan, a country where the phone is status and technology, replacement frequency was often." However, phone subsidies in Japan "are being phased out, and phone sales have dropped like a rock," he said. Phone sales may not drop like a rock in the United States, but there's no question they're being hurt, along with just about everything else, by the economy. In 2008 worldwide, 1.8 billion phones were shipped, 3.5 percent more than in 2007, according to IDC's Worldwide Mobile Phone Tracker. But the fourth quarter of 2008 saw a 12.6 percent decline in shipments. The "one bright spot," IDC said: smartphones, which handle e-mail, Web surfing and video, as well as some word processing and spreadsheet programs. In North America last year, the smartphone market grew 70 percent, and in Europe, the Middle East and Africa, it increased 25 percent, IDC said. Unlike their voice-centric counterparts, smartphones require more of a financial investment — with many subsidized models costing between $100 and $200 — and monthly voice and data plans starting at between $60 and $70. There's also the learning curve investment. Using a smartphone is not as simple as a more traditional voice-oriented phone. Smartphones mean getting to know an operating system, something that takes time and patience, which along with money these days, many of us find to be in short supply. It will be interesting to see how frequently smartphone users upgrade to new models or even change to phones with a different operating system, say going from an iPhone to a BlackBerry or vice-versa. We're certainly seeing new models being cranked out that are variations on recent themes, not entirely new to learn but tweaked in the looks department. The handsome Samsung Behold, for example, is a startling look-alike of the Samsung Instinct, one of the company's flagship phones introduced in mid-2008. Samsung also recently released an Instinct in pink, an alternative to the original black Instinct. At the recent Mobile World Congress in Spain, "Nokia announced the 6700, which is absolutely based on the very successful 6200," said Chamberlain. Phone manufacturers update their models, adding new features and paying close attention to the "external styling," he said. "It's not all that different from the 'planned obsolescence' brought to car styling in the mid-1950s," he said. 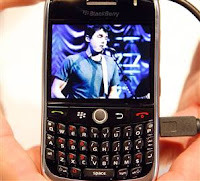 In the BlackBerry Curve's case, the new 8900 runs on a second-generation, or 2G wireless network, which can be slower for Web browsing than third-generation, or 3G. The next Curve iteration, the 9300, may come with 3G, a bigger screen and slightly different keyboard. It can take up to two years to develop a phone, but most phones today are "not built from scratch," said Nogee. "Rather, tweaks are usually made to existing features," something that can be done in months, with the aim of having "new models come out several times a year," he said. Phones that are especially "complicated with a totally new platform — hardware and software — can take more than two years" to develop, said Teng of iSuppli. "The best example would be the Android-based handset," she said, referring to the first Google phone, or G1 as it's known, which was made by HTC and released last year. "Hardware vendors, Google, original equipment manufacturers started to collaborate two years before their announcement (of the phone's release) last year," she said. "In any industry, time to market is important. (Manufacturers) don’t want to spend too much time on developing and planning. They often use the same platform with a little tweak here and there to spin out a different model. In that case, if there are only minor changes in the hardware, the developing time can be much shorter —as little as four months."